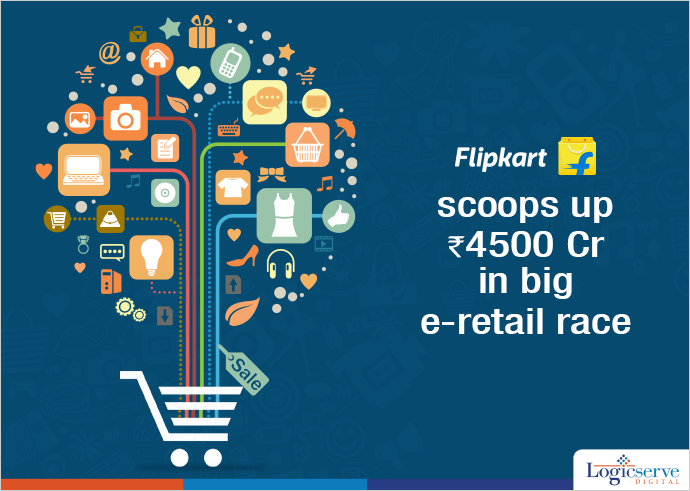 Flipkart, one of the largest ecommerce companies, scoops up funds first time this year, of Rs. 4500 Cr ($700 million) at valuation of $15 billion as the India e-retail commerce companies battle to get larger share. Flipkart was in talks with Tiger Global, New York based hedge fund, since the start of this year for raising a hefty $1 billion. Steadview Captial, its existing investor also participated in raising funds. Last week, another ecommerce giant, Amazon raised $5 Billion with an aim to make India the largest market outside the US. Observing the growing consumptions and comfort level of young middle class Indians in buying online, Flipkart raised about $ 3.4 billion. In 2014, Flipkart made a record, by securing $ 700 million during December (at valuation of $11 Billion) immediately after six months of raising $1 Billion. According to Morgan Stanley, Indian Internet market in the year 2020 is estimated to grow from $11 billion to $137 billion.